With seating for up to eight and copious cargo room, the 2015 Chevrolet Traverse easily accommodates a family like a big, truck-based SUV but offers a more comfortable ride and better fuel economy. It's not the freshest in its class, but the Traverse continues to offer a lot of vehicle and features for the money. 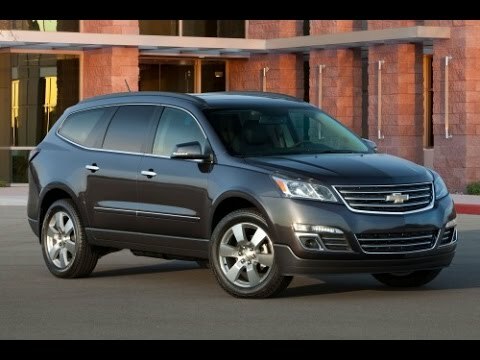 The 2015 Chevrolet Traverse LT-2 is a good large crossover for those that regularly need at least four seats in use, plus gear, and will have extra passengers frequently enough that multiple cars are needed. The ride is very quiet and smooth. As someone who has only driven luxury vehicles previously, I was pleasantly surprised by the leather interior. I purchased this car 3/18 from a reputable dealer and haven't had problems that require me to spend any money. The plastic covering for a vent in the third row did come out, but it was due to my very tall, and careless, 11-year-old, and it was easy to pop back in place. Another issue I've noticed is that the navigation is slow to update, so I highly recommend having your phone ready and reading the directions online to compare with the navigation system. There are three major drawbacks: 1)There is a are huge blind spots, so have the blindspot warning system would be worth the extra cost. This also extends to the lack of parking sensors for the front of the car even though there is an excellent rear camera (it's necessary because the rear window is too small). 2) The estimated mpg isn't accurate, and I'm actually getting 16.9 mpg in the city. 3) There's a very weird pr pi blem with the windows regularly fogging up on the outside in the mornings more than our other cars ever have, including SUVs, and it takes a while for it to go away. Even with these drawbacks, it fits my family's needs for now, my kids love this car, and I'm glad that was able to get a great deal on a vehicle with such safety ratings. Great family vehicle, awesome sound system. Very reliable and safe vehicle. Enough seating for a large family. My traverse has captains seats in the center row which makes it so much easier for people to get in and out of the third row. The backup camera is a wonderful upgrade from my last traverse. It took a few days to get used to using it but now I use it all the time. The stereo system is, by far, the best stock system I have ever heard. The Bose speakers have a tremendous amount of bass and sound absolutely fantastic. The gas mileage is acceptable but certainly not great. My family has taken the traverse on several long-distance trips, plus my work commute is lengthy, so I invested a significant amount of money in fuel. If you are not very good about changing your engine oil consistently and on time then the traverse may not be a great vehicle for you. Failure to stay on top of oil changes results in significant decrease in engine performance. In some cases it can cause damage to the timing components and result in hefty repair bills. Reliable form of transportation, will not leave you on the road somewhere. Rides very smoothly, have not had any problems whatsoever in the three plus years that I have had it. In winter, I love the auto start feature, I can start the car, previously make sure it is on defrost /heat, and hop in and go with clear windows. Very easy to steer, responds well in snow, with the Michelin tires I put on. Did not realize that this model does not have the auto close on the back hatch, would be nice feature to have. I am short, and have to reach high to pull down the hatch, and it is heavy. Good sold vehicle to drive, holds the road, rides very smoothly, and has tons of space to haul things for vacation, or people, has a third seat that folds down for more room. Next one I get, I will be sure the passenger front seat has seat adjustments buttons like the drivers side, when I ride over there, this model has manual features to adjust seat, and not as many options to adjust the seating. If the tire treads crack, a loss of tire pressure and possible tire failure may result, increasing the risk of a crash. GM will notify owners, and dealers will replace the tires that were manufactured within a specific date range, free of charge. This manufacturer has not yet provided a notification schedule. Owners may contact GM customer service at 1-800-521-7300 (Buick), 1-800-222-1020 (Chevrolet), or 1-800-462-8782 (GMC). GM's number for this recall is 15025/15067. Note: This recall is for Goodyear P255/65R18 Fortera HL tires installed as original equipment. For tires that were purchased as replacement equipment, see recall 15T-002.